To celebrate our 5 year anniversary, I made a Boston Creme Pie French Toast for me and Alex for brunch. It doesn’t feel like we’ve been married that long, but in other ways, it’s not surprising. I hardly remember when I didn’t test recipes for this website – and Alex and I have been married longer than that! This French toast wasn’t difficult to make overall. It’s true that there’s 3 components – French toast, creme, and chocolate sauce – but I completed the more complicated part of the prep (making the creme) the night before. The breakfast was certainly rich and decadent, but totally worth it. This was incredibly rich and delicious. 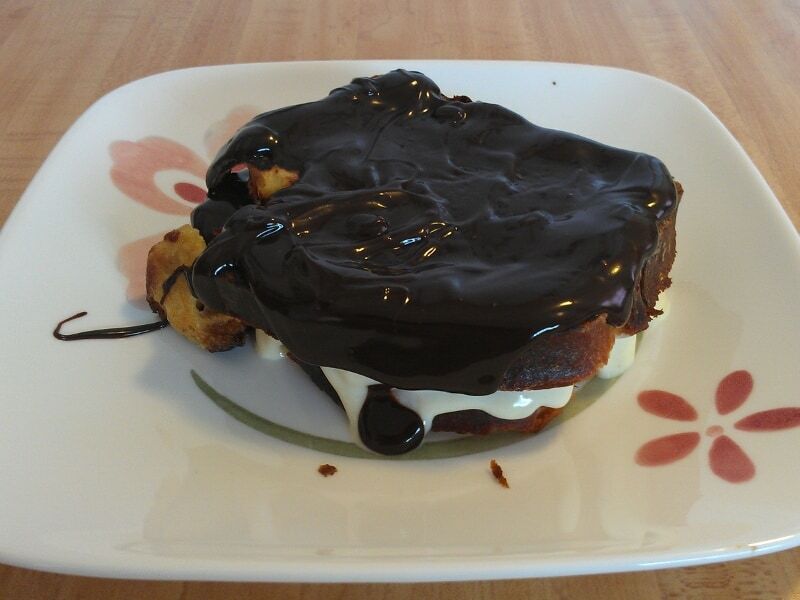 I don’t have Boston Creme Pie very often, but Alex noted that it did taste just like a Boston Creme Pie donut. 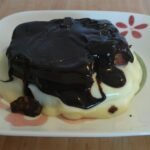 I loved the combination of warm French toast with sweet vanilla and rich chocolate. My creme was not as thick as it looks in the original recipe, so it oozed out the sides on the first sandwich I made. I used less for my second sandwich, but this made the creme disappear in some areas. I served extra creme on the side for dipping, which was a fantastic idea. I also served it with strawberries on the side, which were delicious vehicles for vanilla creme and chocolate sauce. The pastry creme I made was delicious, but I would have been happy enough just layering the French toast with the base pudding without mixing in the whipped cream. The whipped cream lightened the pastry creme texturally, but I’m not sure if it was worth the extra calories or slight amount of additional work. To make this French toast again, I’d layer it with any vanilla pudding I wanted. Brioche was perfect in this, and the chocolate sauce worked wonderfully. I’ll definitely do something similar to this for other special weekend breakfasts. This incredibly rich and decadent breakfast is perfect for a special occasion. Combine 2 1/2 cups milk with the sugar and salt in a medium saucepan. Heat to a simmer over medium heat, stirring occasionally, until sugar dissolves. Meanwhile, whisk together egg yolks with 1/2 cup milk, cornstarch, and flour until well combined. Whisk 1/2 to 1 cup of the hot milk into the egg mixture gradually to temper the eggs, to make sure that they don't scramble. Pour the mixture through a strainer back into the hot milk while whisking constantly. (You may need someone to help you with this!) Whisk constantly until mixture thickens, then continue to whisk and cook the pudding for an additional minute. Remove from heat and add vanilla and butter, stirring until butter melts. Pour into a container and lay plastic wrap directly on the pudding to prevent a skin from forming. Chill until cold, or overnight. To complete, whip 1 cup heavy cream until it forms soft peaks, and fold into pudding. Whisk together the milk and the egg. Soak the slices of bread for 1 minute on each side. Heat a nonstick skillet over medium heat, and add butter or oil to coat. Once the oil is hot, drain the bread and lay in the skillet. Cook on each side for about 2 minutes. Repeat process with remaining bread. Microwave chocolate chips and heavy cream in microwave for 30 seconds (or less, since my microwave is low wattage). Stir until chocolate is melted. Microwave for another 5-15 seconds if chocolate chips are not melted. If you do this before you make the French toast, microwave for another 5 seconds and stir to make the chocolate sauce smooth. Lay one slice of French toast on a plate. Add about 1/2 cup (or more, if you want) of creme, then top with a second slice of French toast. If you use more creme, it might ooze out the sides. 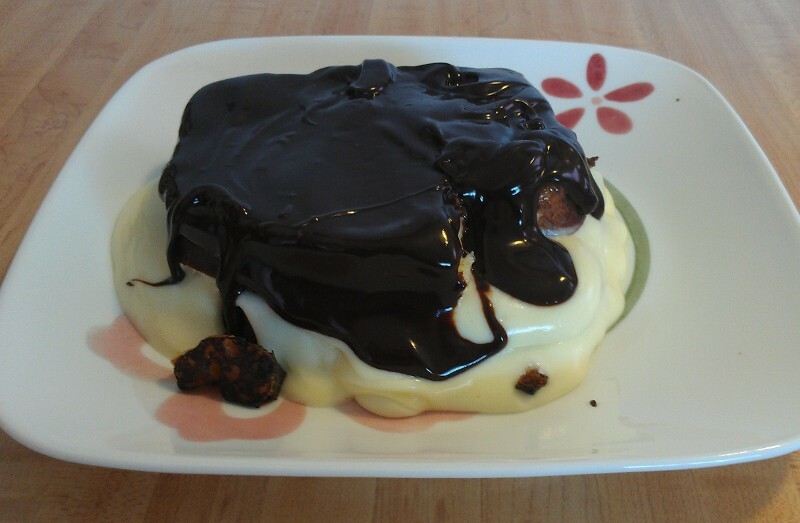 Top with chocolate sauce, spreading it out and letting it drip down the sides. Serve warm, with extra creme on the side if desired. Yields 2 servings. Double the French toast and the chocolate if serving four, but the creme should be sufficient for many more.